When nature-loving Coloradans get cancer, they’re often sidelined from the activities they used to enjoy. 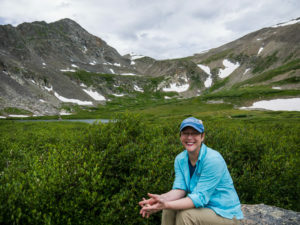 Fortunately, Colorado is home to several organizations—all founded, unsurprisingly, by local outdoor enthusiasts—to give patients, survivors and caregivers a way to find community and regain confidence in their physical abilities. 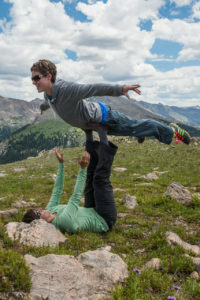 In 2014, Denver resident Valerie Schwebach saw a Live by Living flyer in her oncologist’s office promoting outdoor activities to cancer survivors and caregivers. She has since regularly attended the nonprofit’s hikes and retreats. During her first walk, she was in active chemotherapy for breast cancer—the most difficult phase of her treatment, she says. While everyone knows someone who has been affected by cancer, surveys and studies reveal that cancer patients and survivors of all ages frequently suffer from loneliness and isolation. Each of the three organizations interviewed for this article addresses this issue by helping participants build a sense of community, keeping groups small to foster lasting connections during and after the experiences. 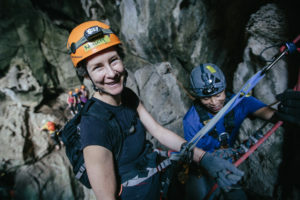 Live by Living participants are generally over 40 years old, and its free program is tailored to cancer patients who aren’t interested in or cannot partake in more intense sporting experiences. Founder Dan Miller started the organization in 2008, a year after losing his wife, Julie Wrend, to cancer. When the two met, Wrend was already a breast-cancer survivor, and they spent a lot of time hiking, backpacking, and cross-country skiing. After a recurrence of cancer that spread to her uterus, she died in 2007. From weekend retreats at 10th Mountain Division huts to “well over 100” hikes and walks each year, Miller says Live by Living has chapters in Fort Collins, Grand Junction, Durango and Colorado Springs. Retreats require medical clearance and walks are self-selecting, usually at a paved, urban park in Denver. Caregivers and survivors are also welcome. Epic Experience, based in Arvada, is celebrating five years of providing free winter and summer weeklong retreats, says co-founder Colin Ferro. Patients and survivors apply to Epic Experience looking to make memories and prove to themselves they can still enjoy an active lifestyle, he says. Most Epic participants are 18 to 79, but “we’d love to have an 80-year-old,” he says. Ferro’s brother beat testicular cancer after a 2007 diagnosis. Ferro and his mom, Nancy, work together at Epic to help cancer survivors embrace life and the outdoors again. To this end, two of Epic’s outings annually are restricted to Colorado patients and survivors. All Epic retreats take place at 7W Ranch in Gypsum, Colorado—the second-oldest dude ranch in the state—which donates the use of the property to Epic. First Descents offers 18- to 39-year-olds weeklong, multiday and single-day camps for all stages of the illness process at no charge. It caps programs at 15 participants to enable deep social connections for its young people, who can be especially jarred by a cancer diagnosis. Ray Shedd, director of development and marketing of First Descents, says ongoing psychosocial, supportive care is one of the main determinants of survivorship health. 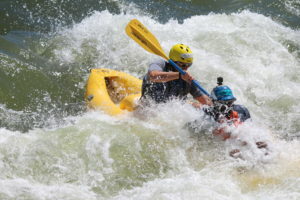 While the organization began in Denver, it now has 15 local adventure communities called FD Tributaries, which help people stay in touch after their retreat experience. How can I get more information on the Epic Experience? I just finished very harsh Radiation treatments a month ago and am healing from severe burns. I truly could use this as a life line. Blessings. Please put me on your email list. I am a Ovarian cancer patient and live in Durango, CO.
Hi Susan – wishing you a full and swift recovery!